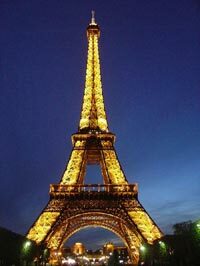 Paris city and your free choice of the main areas of interest such as: Nôtre Dame, Musée d'Orsay, the Eiffel Tower. Full Day (approx. 13 hours) This tour is not refundable. Round-trip Eurostar reserved seat on Eurostar, unescorted one-day Paris Visite Travelcard, map of Paris. Daily except Sunday after optaining from us by email our confirmation number that seats are available. 0233E Email us first asking for availability to avoid bank charges. For this trip, please email us first of all asking us for availability. We will email you back with a reservation number. After obtaining our price, list of what is included and reservation number, we will ask you to confirm with payment within 2 days. Should you not be able to do that, please email us again when you are ready to book as we need to confirm to you if there are still seats available. Guideline: Round-trip Eurostar tickets and seat reservations, 1 night hotel and breakfast in a first class hotel, River Seine Cruise, one-day Paris Visite Travelcard and map of Paris including Public Transport. Departing from London International station by Eurostar, this unescorted Paris trip arrives approximately 2.10 hours later. In Paris, you may want to enjoy a fully guided panoramic motor coach tour of the city seeing the Champs Elyses, Arc de Triomphe, Notre Dame, the Eiffel Tower and much more, (not included). Free Cruise along the River Seine. Free Time for your private visits or shopping and lunch. the name described in the ticket. * Any other reason apart from Eurostar cancelling the tour due to lack of demand, in which case a full refund will be forthcoming.